With a blog named Bacon is Magic, understandably food is a big part of my life. But it wasn’t always the case. In fact I grew up in a household that had a steady rotation of 10 or so bland dishes. Somewhere along the way my Italian roots kicked in and I taught myself to cook. So for the past ten years, when I’ve returned home for Christmas, I do the cooking. And food becomes a hot topic as I struggle to find something my family will like. They have become more adventurous, on trips to Toronto my mother discovered she loved Tom Yum soup and did not completely hate sushi. My sister has been cooking on her own and is starting to appreciate bolder flavours. So they knew when they came to Ecuador we would be eating local food. Not wanting to make it a completely traumatizing experience we often ate Ecuadorian for lunch and then something familiar for dinner. I was very proud of their openness, and while I would not call Ecuadorian food a shining culinary example, they did find some food they liked. 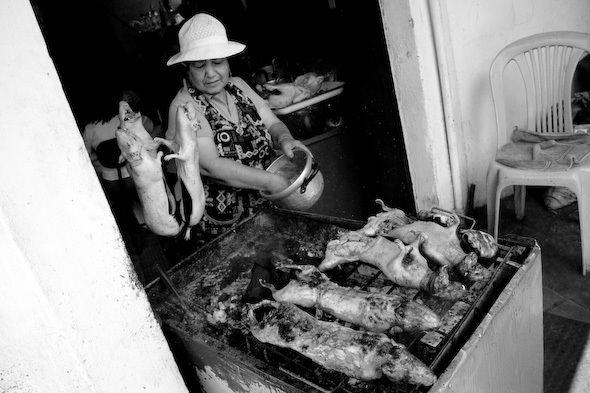 But the crown of the culinary travel experience in Ecuador is cuy – also known as guinea pig. 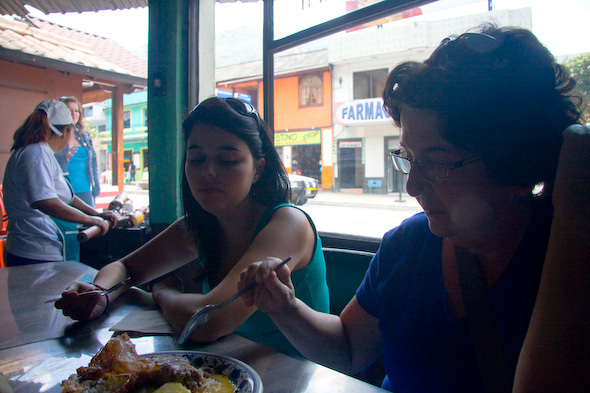 After speaking to many locals, it turns out that most Ecuadorians only eat it for special occassions and most of them don’t like. But that didn’t stop me from wanting to try it. I was disappointed that the restaurant in Cuenca was closed on Mondays but happy to find out that you could also get it in Banos. And what was better was that while Cuenca is known for cuy, they often fry it to a crisp so you can the entire body, almost appearing as a rigid scream. But in Banos they cook it over open coals and, let’s face it everything tastes good in the barbecue. In Banos, just outside the market there are two restaurants that sell cuy. We ordered two 1/4 portions for $3 each and I quickly reminded my family that making any gestures that the meat was disgusting would be rude to the locals who were happily eating lunch. Surprisingly, the meat was pretty good, and not surprisingly tasted like dark meat chicken. There isn’t a lot of meat to the little critters so it’s easiest to just pick them up and eat them like wings. So as one final gesture to this family adventure we conquered the food and moved on to get Ecuador’s true epicurean treasure – ice cream. Haha.. Your sister doesn’t look so impressed. Mine always liked dark meat on a chicken, I should encourage her to eat guinea pig! Great post, girl! Loved reading about your family and how much of a departure from what they were used to to try “cuy.” And wow, I will forever think of guinea pigs as dark meat wings… Your writing and descriptions are fantastic! I’m having a Matrix moment of why everything tastes like chicken. I bet you wish it was that everything tasted like bacon huh? You are always very happy to try different things! Me, a good old peanut butter sandwich is the perfect lunch! !Maybe I shouldn’t travel!! Yum! I’ll have two portions please. This could easily turn me into a vegetarian. I think it’s to do with their shape and seeing them whole. Cut into pieces might not be so bad…maybe! They gave us the hind pieces so it looked less like roadkill although my mother did cringe at seeing its feet. I can’t wait to try it! I’m glad your family can be adventurous – I’m not sure mine would be in that case! yeah…i’m a huge fan of dark meat chicken but even given your description i don’t know if i could try this…bravo to you and your family though for eating like locals and being adventurous! Ive heard a lot about CUY but I still dont think I would be able to eat it. I guess when I am there I would but since I am not for now I would probably not…lol!!! I love the B&W pic, I also love the way your sister (i think) is looking at the food. I’d give it a chew. That look entirely too tempting for me! Soon I shall have to venture that far south and give it a shot. I used to be a really picky eater up until a few years ago. I was really hungry and stuck in a village and had no choice… when I realized that it was actually good and I was making a big deal out of nothing I decided that I’d at least try anything once. 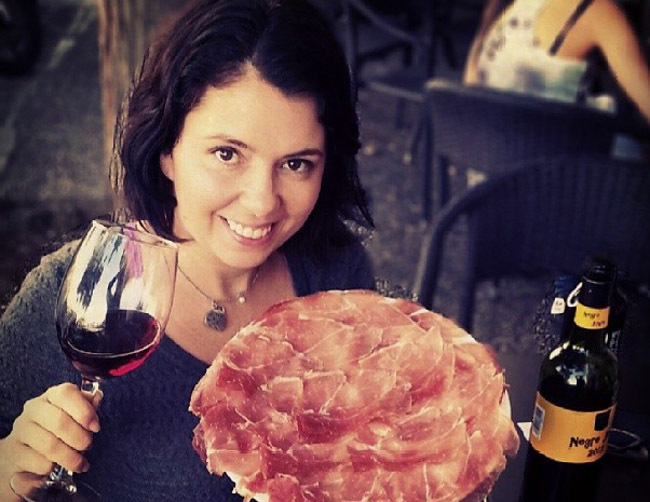 When I started to travel I made a pact that I would try all the local meats and delicacies that I could just to really explore what food is out there in the world. Guinea pig really did taste like chicken. What was worse was the guy I was with would eat anything (moreso than me). We got the entire guinea pig baked in a really nice restaurant (not some street vendor) so it was really well prepared. It still had some hair on it in some places though. My friend he ate the entire thing except the bones… that’s including the ears, the heart, the brains, everything… he even sucked the eyeballs out of the little skull. It was too much for me to handle. I have to draw the line somewhere! I made a big deal out of it at the time. He just laughed. Yeah NVR Guys, childhood pets…. Guinea pigs were so much a part of our kids life. I won’t be eating one.The night they called, more like screamed to me for help because a ferret was chewing one up slowly still alive …. I got too much love for them. No, still could not eat it. Even if it does taste like chicken. The head, the eyes urgh! We ate guinea pig in Puno, Peru. Gotta say, as a lover of most things foodie, guinea pig did not do it for me. Could have been the way it was prepared (or the 3 days of stomach pains afterwards!) but I found it to taste more like a very greasy duck with a strong aftertaste. that said, it wasn’t prepared the super deep fried way, which would likely make it taste like KFC. I didn’t try cuy in Peru but I am going to compare it. I had it over a charcoal grill and I have to say I’d eat it any day although my Ecuadorian friend scolded me for saying it tasted like chicken as it has its own unique flavour. I do think the preparation may make a difference and the charcoal may help dry out the greasiness you had in yours. I’m heading there next week so I’ll have a look for it. Oh goodness!! I don’t know if I could eat it, but you did make it sound kinda tasty … I used to have little pet pigs, so probably won’t be trying this delicacy anytime soon. I also had Cuy when in Ecuador, and I agree: it tastes like chicken!